As a student, economy is very important in my meal plans. This is a dish I make quite often, that costs a whopping 46p per serving, provides one of your "five a day" and 6% of your protein RDA. 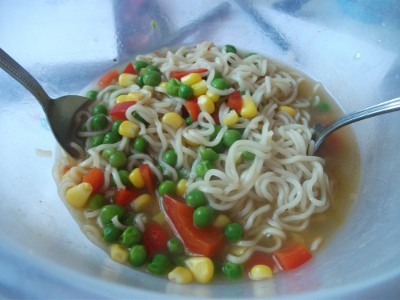 Tesco's 11p noodles are one of my favourite things in the world - they're vegetarian if you throw away the flavouring packet, and they have a nice texture. You can substitute in any other brand of instant noodles - you just might have to adjust the cooking time and amount of water. This serves 1. 1. Heat up the sesame oil in a saucepan, then add the onion and five spice powder, and fry for a minute or so. 2. Add the boiling water, stock cube, frozen vegetables, bell pepper (if using) and chilli flakes, and bring to the boil. 3. Add the noodles and cook for 2.5 minutes, stirring occasionally. Serve with a spoon, fork and napkin. It's messy to eat!